Sen. David Zuckerman argues against eliminating the philosophical exemption to Vermont's vaccine mandate. Sen. Kevin Mullin (R-Rutland) stirred up an emotional debate outside the Statehouse last week when he introduced an amendment intended to increase Vermont's vaccination rate. But when the late-session proposal came up for a vote Wednesday afternoon, his colleagues made quick work of it. After less than an hour of discussion, the Senate voted 18 to 11 to scrap a provision that currently allows parents to opt their children out of mandatory vaccinations for purely philosophical reasons. If signed into law, the amendment would still allow children to attend public schools if they qualified for a medical or religious exemption. Whether the House follows suit in the final weeks of the session remains unclear. Speaker Shap Smith (D-Morristown) and Rep. Bill Lippert (D-Hinesburg), who chairs the House Committee on Health Care, said Wednesday they have yet to decide how to proceed. In the Senate, the proposal came up last week as a surprise amendment to an unrelated bill concerning disease registries. Members complained at the time that the unexpected airing of such a contentious issue prevented them from hearing testimony from experts. They opted to delay the vote by a week, allowing the Senate Committee on Health and Welfare to hear from both sides Wednesday morning. 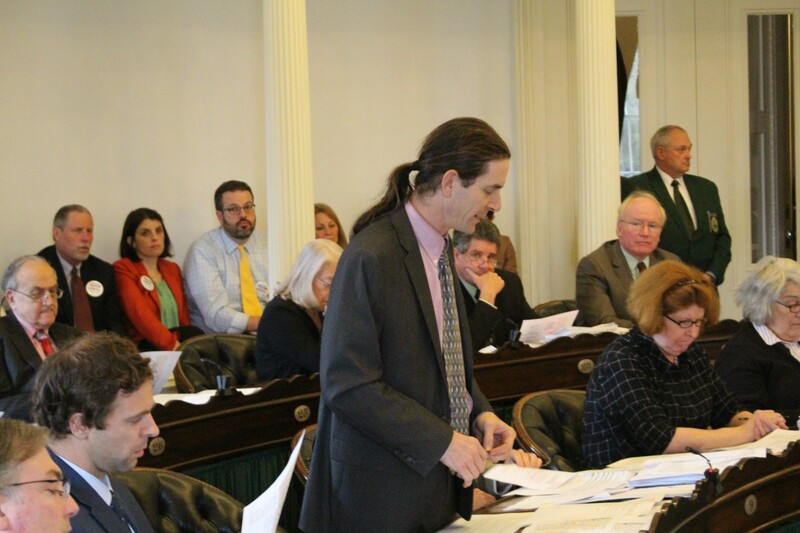 During the floor debate later in the day, Sen. David Zuckerman (P/D-Chittenden) argued against doing away with the philosophical exemption. He said the science of whether vaccinations are safe is "disputed." "What we put into us, whether it be the food we're eating, the various things we consume in society or shots and whatnot into our body, this is the one vessel or being that we completely control," he said. "And we are adjusting the laws of our state to such that someone else is determining — we in this room are determining — what is going to go into every single person's body." Zuckerman attempted to further amend the bill with a provision that would keep the philosophical exemption in place until the Centers for Disease Control and Prevention "determines that there is a reliable DNA swab test to check for the genetic predisposition to an allergic reaction to various immunization ingredients." He later said that "maybe it requires a more rigorous test." "I don't know," the organic farmer conceded. "I'm not a scientist." His amendment failed by a voice vote. Sens. Ann Cummings (D-Washington) and Anthony Pollina (P/D-Washington) argued that eliminating the exemption would leave children whose parents oppose vaccinations with fewer educational options. They also wondered whether it would have a negative fiscal impact on schools because fewer students would attend. Supporters of the amendment largely held their fire, likely because they were confident they had the votes. In the end, the margin was closer than in 2012, when a similar measure passed the Senate by a 24 to 4 vote. It was later watered down by the House. Like the Senate, the House has not focused on the subject this year. Lippert said his committee has been too busy working on a health care reform bill. He said his peers were divided on the issue and that a path forward was not clear. For his part, Smith said his leadership team had yet to canvass the Democratic caucus to gauge its support for the idea. But he said his personal views were clear. "If I were to vote on it, I would vote to remove the philosophical exemption," he said. Gov. Peter Shumlin said earlier this year that he supports retaining the exemption.